Click Here for our Home Page for details on ATW Shrink Wrap, Shrink Wrapping Systems, L-Sealers, I-Bar Sealers, PacWrap Heat Guns and Bag Sealing. Manufactured in America for over 30 years! 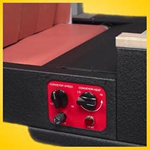 Plugs into any 110v outlet (220v version available), portable table top design or built on its own optional stand, heavy-duty steel construction, variable speed heated conveyor with separate conveyor belt thermostat, temperature range 0 to 550 f (288 c), energy efficient with automatic cool down after use, isolated electronics for safety, shrinks up to 22 packages per minute. Perfect for most shrink bands, shrink sleeves, shrink tubing and bags, and shrink films. 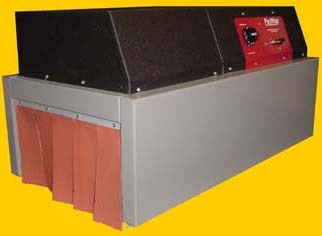 Call and let us customize the heat and airflow perfectly for your products at zero cost to you! Permanently Lubricated Motors, Blowers & Fans provides you maintenance free performance for reliability. Designed and built to run 24 hours a day under continuous use. These PacWrap® Turbo-Aire™ Shrink Tunnels deliver industrial quality performance with virtually any shrink film, yet operate on standard 110 volt power (20 amp circuit required). 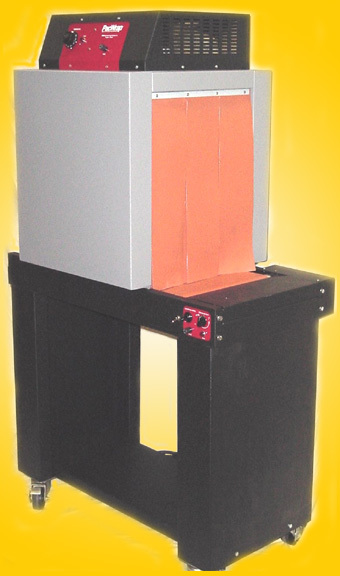 We also manufacture 220/240 volt models, suitable for 50/60 Hz power. Energy Efficient / Fully Insulated Heat Tunnel Chambers - Isolated electronics for long life and safety. Dual Side Ducted, recirculated heated air, the most energy efficient! Separate Thermostats for the tunnel chamber and heated conveyor belt assures complete heat coverage for fast, uniform shrinkage of shrink film, shrink labels, shrink bands or shrink tubing around the package. 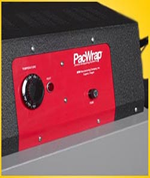 The Automatic Cool-Down Cycle on these PacWrap® Shrink Tunnels will save you time and money for years to come. How does it do that? 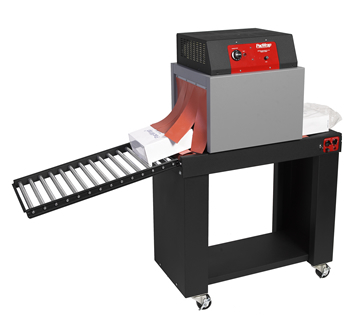 By eliminating the need to manually turn down the thermostat and cool down the chamber and conveyor after each use. With Automatic Cool-Down, when your shrink wrapping is completed, you simply flip-off the main power switch. The heaters then shut-down while the motors, blowers and fans continue to run until a safe stopping temperature is achieved. (About 10 minutes). Then the tunnel will automatically and safely shut off. This automatic cooling after each use feature not only makes these shrink tunnels easy to use, it greatly extends the life of the motors, blowers and fans. Automatic cool-down eliminates the daily setting up of the correct temperatures and conveyor speeds. It really is "set it once and forget it". Once the operator is happy with the shrink results coming out of the tunnel, THERE'S VIRTUALLY NO NEED TO TOUCH THE HEAT CONTROLS AGAIN! Quick 7 to 10 minute warm up times too! With your choice of heat tunnel chamber heights of 8 inches, 12 inches and 20 inches, these tunnels are designed and built to provide the perfect combination of heat and airflow for virtually any standard shrink band, shrink sleeve, shink film or shrink tubing. Highly energy efficient, these heat shrink tunnels feature 15" wide tunnel chamber openings. Factory direct prices, economical to own and operate. There's no need to buy heat shrink tunnels used when you can have a brand new, designed and built in America, shrink tunnel machine designed to run 24 hours a day, and customized (usually at no cost to you) for your application. © 2001 - 2019 ATW Manufacturing Company, Inc. Eugene, Oregon. Automatic Cooling and Shutdown after use.